Dennis Bergkamp has finally put pen to paper on a new one-year deal with Arsenal. Bergkamp looked set to leave Arsenal after he stayed behind in Holland following the breakdown of initial negotiations. But the 34-year-old has now settled his differences and is delighted to have finally sealed a new contract with the London club. "I'm so pleased to have signed a new contract," said the veteran Dutch striker. "As I have always said, Arsenal is a fantastic club and it has always been my intention to end my career here. "I'm delighted to be part of a great squad of players, which gives us a realistic chance of winning trophies again this year." Arsenal manager Arsene Wenger is also pleased with the news as he looks to assemble his squad for next season. "I have always said it is important to retain the players we already have here so it's great news that Dennis has committed himself to the club for another year," said Wenger. "He has so much to offer. Dennis is a special talent with vast experience and that will certainly help us in our pursuit of honours." 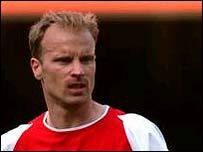 Bergkamp, however, will face a battle for regular action in the Premiership in the forthcoming season. Wenger, who has also been linked with a move for Lens striker Daniel Moreira, has offered Bergkamp no guarantees of first-team football despite his continuing faith in his ability. "It is very difficult to say who will play up front alongside Thierry Henry this season," declared Wenger. "Will it be Aliadiere, Wiltord, Jeffers, Bergkamp or Kanu? We will have to see."